What is a Mattress Report? Homeserve specialise in leather and fabric recovers nationwide and offer a service that will make the suite looking fresh and brand new for a much smaller cost. Creating the ideal sofa or chair is easy and straight forward with Homeserve. Either use the service we offer to create your favourite version of a new sofa or chair or refurbish an existing piece of furniture to bring it back to showroom standard. We will send out a team to collect the furniture and return it to our workshop where our team of expert upholsterers will re-cover the furniture for and then we will deliver it back at a time that's convenient. Are your customers in need of a sofa re-cover, Homeserve can get out to re-cover their suite within 5 days. Saving you a replacement on a sofa. Homeserve offers an onsite re-upholstery and restoration service for resteraunts, bars, hotels and the leisure industry. Homeserve offer a re-upholstery service on your recliner chairs/sofas on site. Do you have a question you would like to ask us? Want to find out more about what Homeserve are all about. 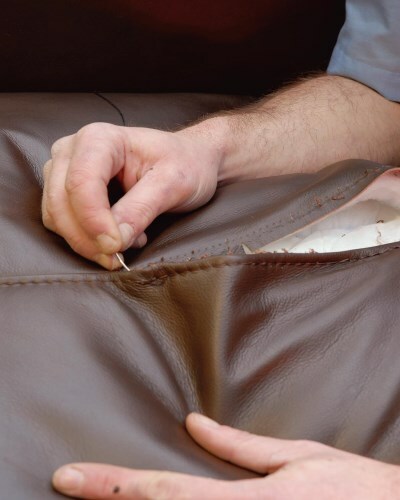 Homeserve Furniture Repairs is an independently owned company which provides a dynamic, on site repair service for leather, soft furnishings, beds and cabinets with a Passion for Perfection Guaranteed! Unit 2 Delph Road Industrial Estate, Delph Road, Brierley Hill, West Midlands DY5 2UA.